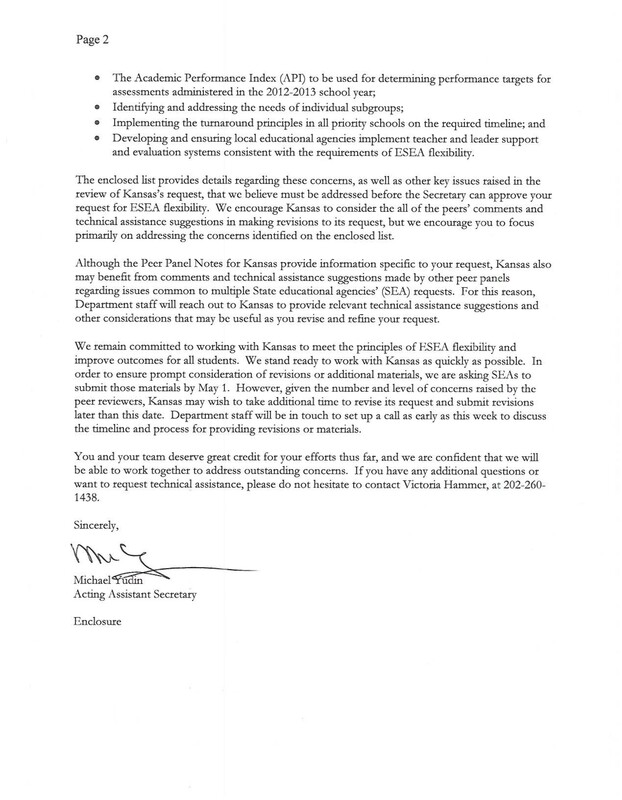 The U.S. Department of Education has a few questions, and staff members at the Kansas and Missouri state departments of education are busy answering them. The deadline was May 1, but there seems to be some flexibility in the schedule. 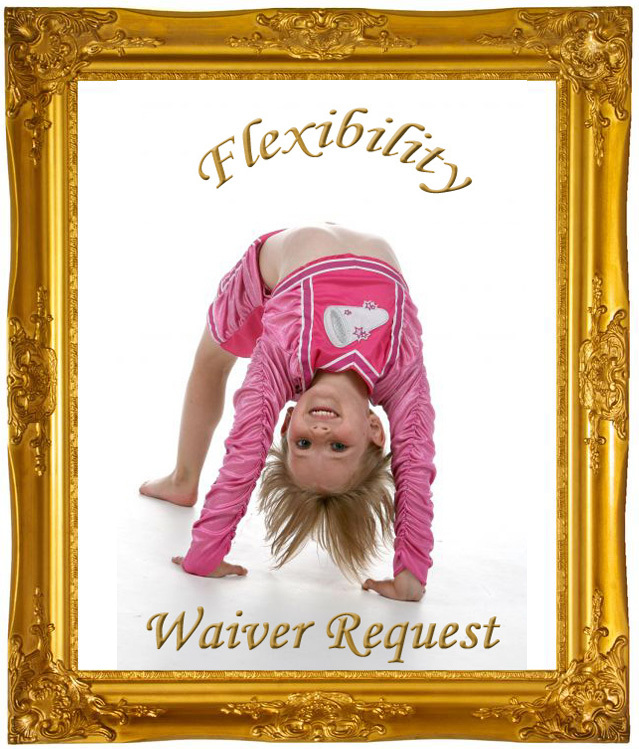 “Flexibility” is the key word here, because the questions are about the states’ requests for so-called “flexibility waivers.” If granted, these would be waivers of requirements of the No Child Left Behind Act (NCLB). Both Kansas and Missouri were among the second round of waiver applicants, and announcements of states receiving approval was supposed to come late this spring. But before the feds make their decisions, there are some questions to answer. 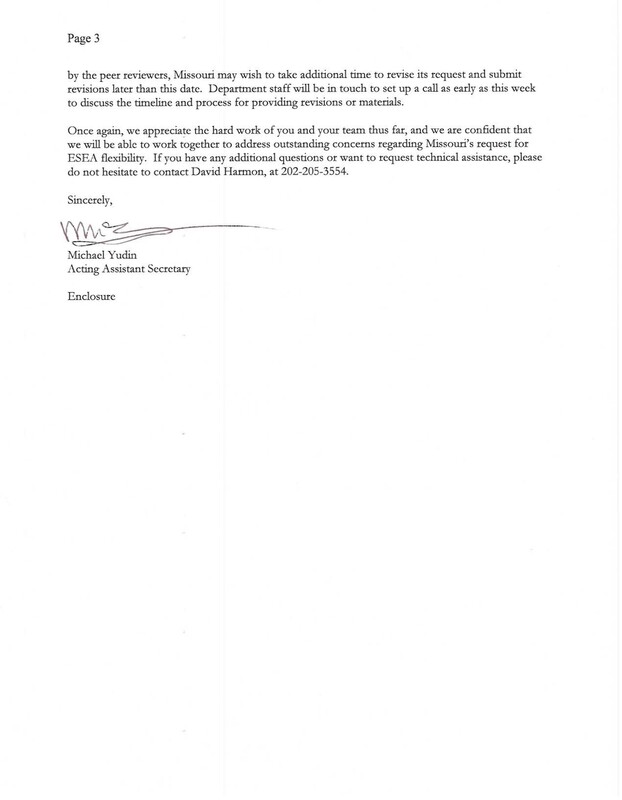 Despite the May 1 deadline, both states have received word that, “given the number and level of concerns,” each “may wish to take additional time to revise its request and submit revisions later than this date.” According to the letters, federal reviewers had “significant concerns” about four aspects of Kansas’ application and five aspects of Missouri’s. There do not seem to be any simple themes among these concerns, which are all technical and specific to the applications. 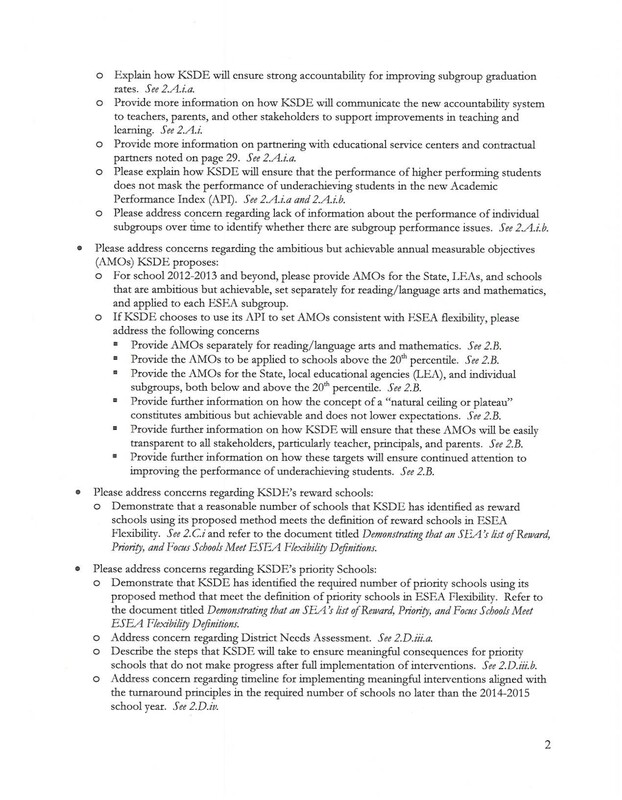 Each of the state education departments also received several pages of other reviewers’ comments that they may wish to address in revising their applications. Of course, as with any balanced critique, the reviewers also identified strengths of each application. 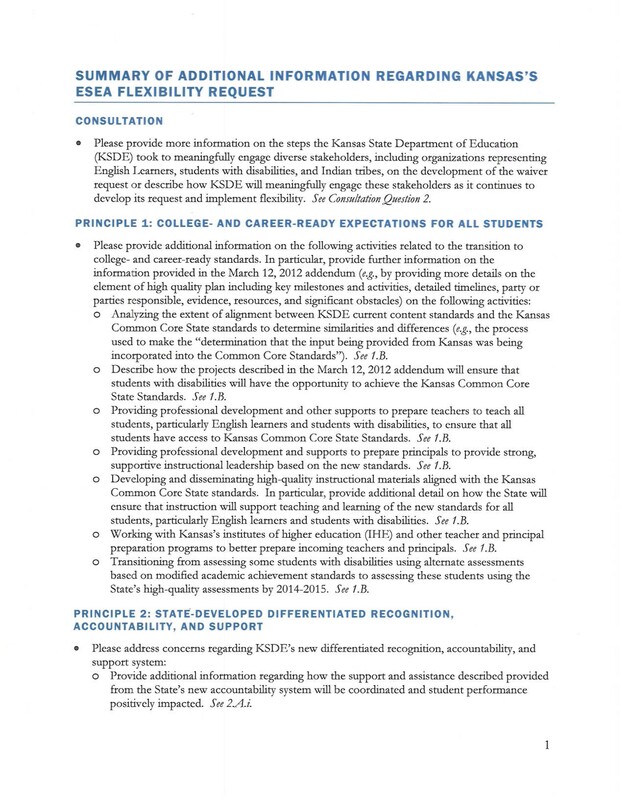 The strength of Kansas’ flexibility waiver application, they wrote, was in the way it proposed to recognize and reward high-performing schools and teachers. 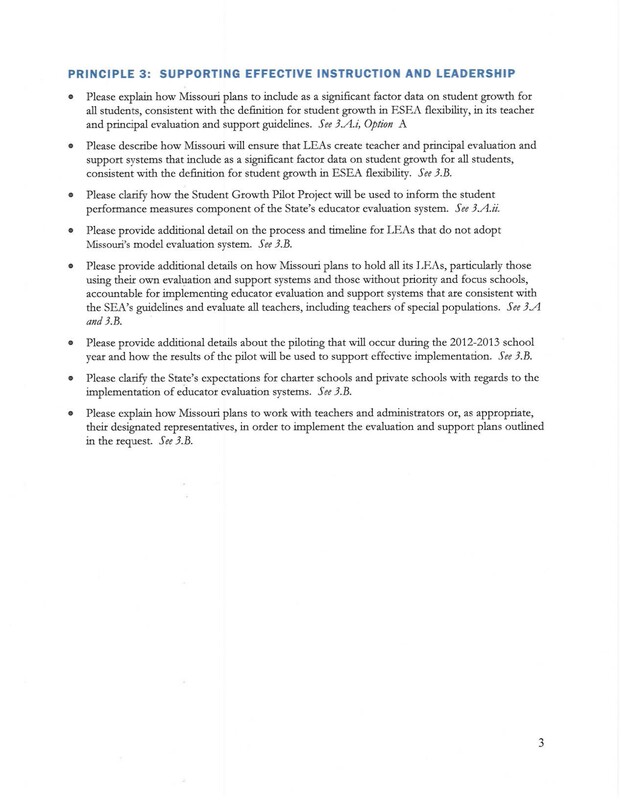 Missouri’s application had two strengths, according to the reviewers. 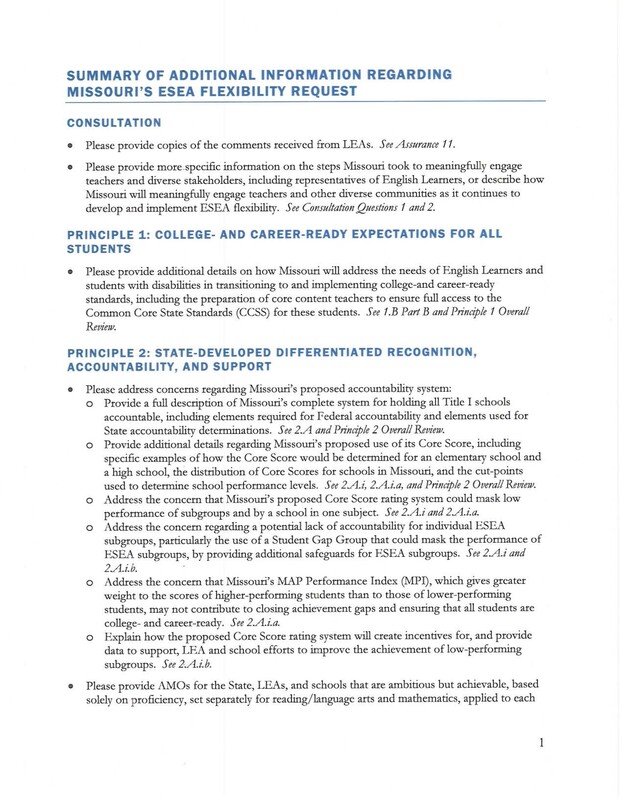 One was the state’s plans for a quick transition to college- and career-ready standards in English and math; and, the other was its evaluation plan for teachers and principals. Most agree with the intent of the No Child Left Behind (NCLB) Act, which is to narrow achievement gaps between advantaged and disadvantaged public school students. 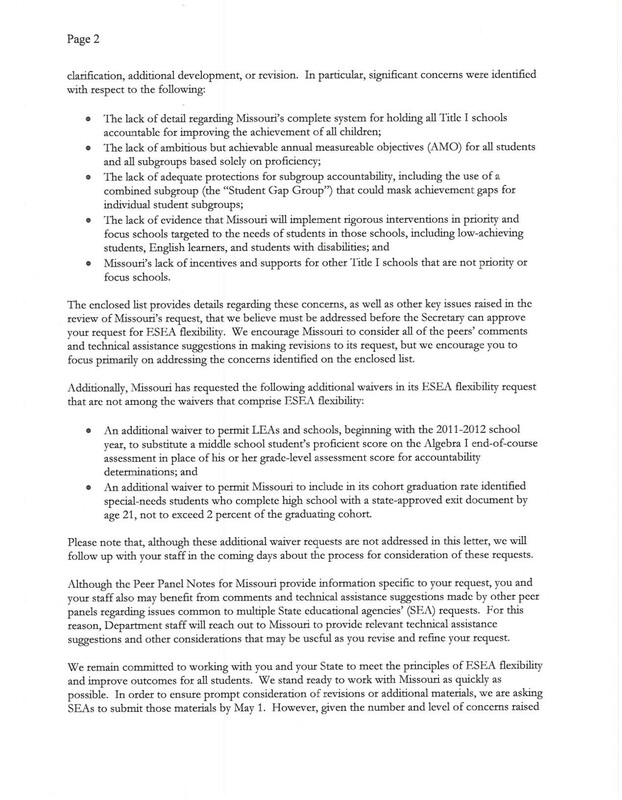 However, the goal of 100 percent proficiency on state standardized tests by 2014 appears to be unrealistic. Because Congress is overdue on reauthorizing the act, U.S. Department of Education Secretary Arne Duncan has said states may apply for waivers that would provide districts with flexibility in accounting for student progress. 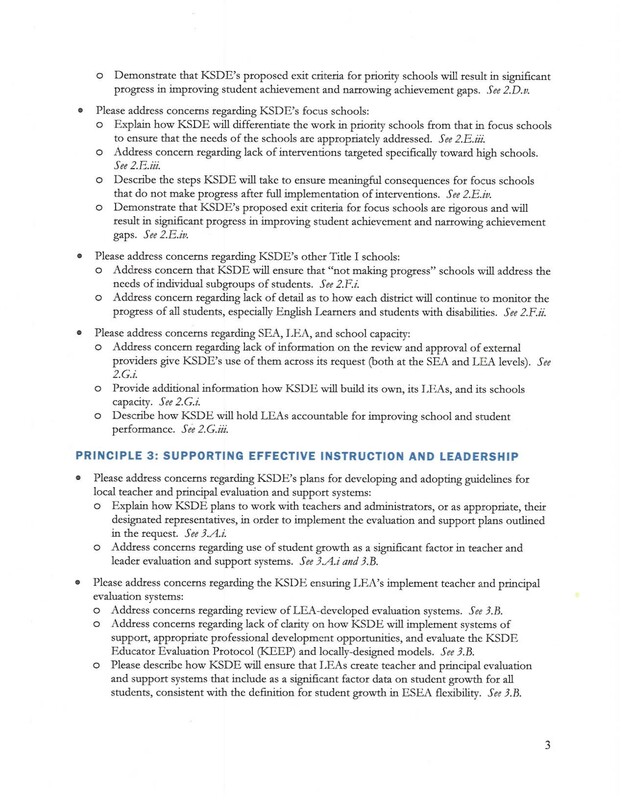 In order to qualify for waivers, states must devise alternate ways for schools to demonstrate student academic achievement. States must develop college- and career-ready standards. 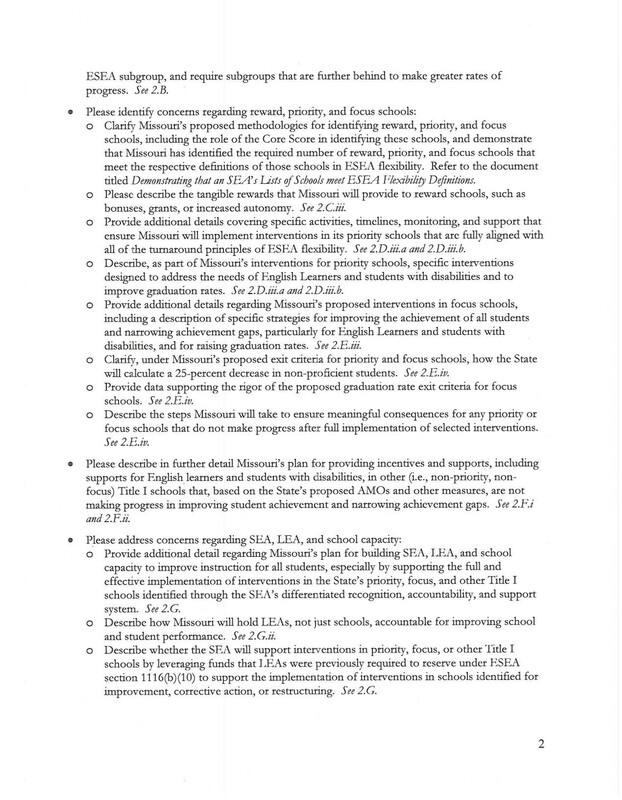 They must develop ways to recognize schools’ achievements in educating all students, hold accountable schools that are struggling and support those in need of improvement. In addition, states must change the way teachers and principals are evaluated. Last year, eleven states were among the first to apply for flexibility waivers. Initially only 10 received approval. However, after working with the U.S. Department of Education to revise its application, the 11th state was successful. Earlier this year, Washington, D.C., and 26 states — including Kansas and Missouri — were among the second round of applicants. Almost all — at least 21 out of 27 — applicants have received letters from the federal government suggesting revisions. 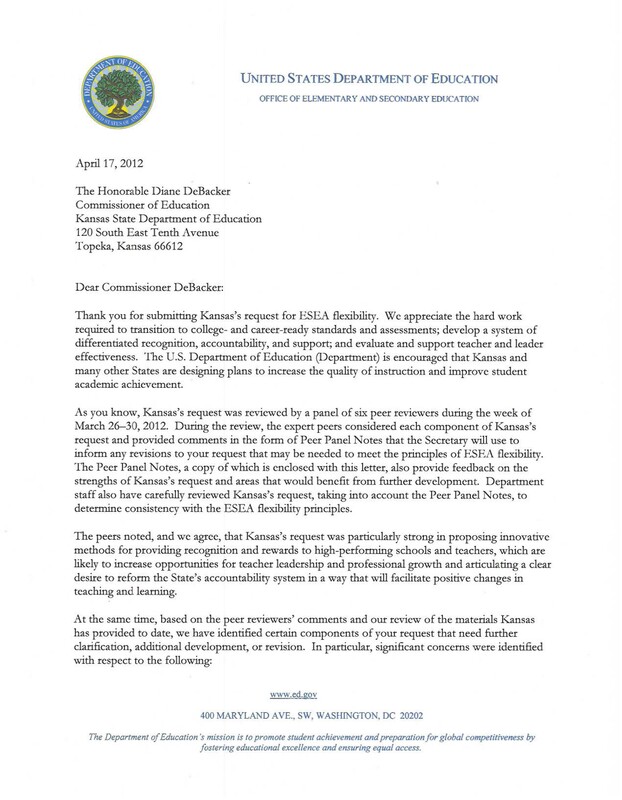 Alyson Klein, who covers policy news for Education Week, has posted a blog analyzing all publicly available letters and responses from a national perspective.